Arrive in Paris, the romantic capital of France. Transfer from the Charles de Gaulle airport to your hotel for a 2-night stay. * After check-in, enjoy free time to explore this exciting city, or join our “welcome walk” to stretch your legs and get oriented. Pay your respects at the Luxembourg American Cemetery. Discover ancient Roman Trier. Taste exquisite Moselle Rieslings and visit the wine town of Bernkastel-Kues. Explore Sankt Goar, nestled in the Rhine Gorge between the Lorelei Rock and Rheinfels Castle. See Speyer’s Romanesque cathedral. 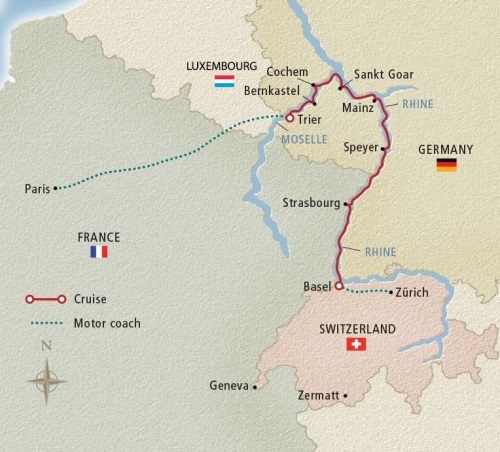 Vineyard-flanked slopes and historic cities make a Moselle and Rhine cruise alluring enough—added hotel stays in the “City of Light” and Zürich make this 12-day cruisetour irresistible.